A hearty congrats to Imagine a Center for Coping with Loss, the recipient of the top donation from The Sue Adler Team’s second annual 100th Home Sale Charity Program! Voting this year was even more competitive than last year with a total of 31,700 total votes. It only seems fitting to spotlight them and take a deeper dive into who they are and the value they have added to so many in our community. Imagine provides free grief support for children, families, and communities coping with the death of a parent, sibling or child for as long as the family or child needs them. Currently, Imagine is serving over two hundred fifty children and families from forty-seven New Jersey towns that come directly to their center in Mountainside for support every other week. Imagine also provides education and training to schools, houses of worship and the workplace as well as onsite support after a death in those areas as well. Imagine uses the peer support group model, they use paint, music, writing, and clay as well as physical play and movement to teach kids and families constructive coping tools. Our entire team was blown away by just how extensive their program is when we went to visit them. 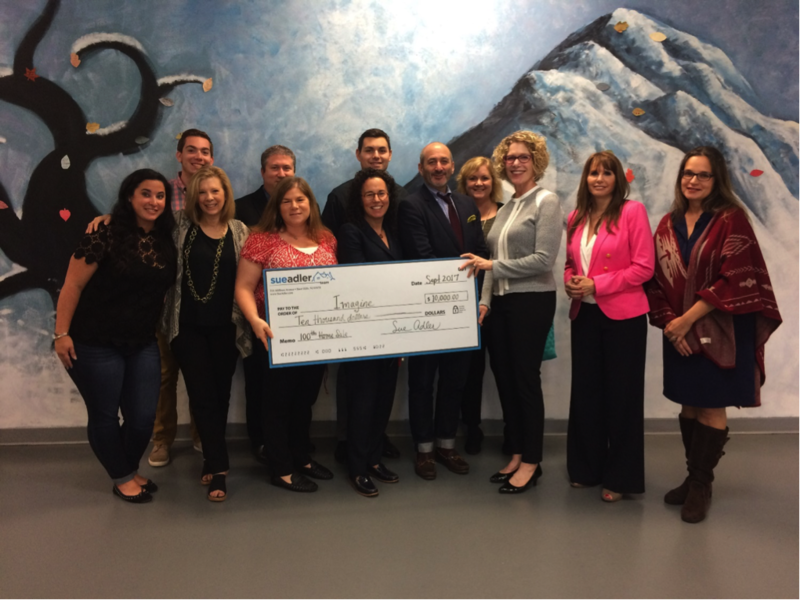 Based on the massive amount of votes they received during The Sue Adler Team’s 100th Home Sale Charity Program, the immense impact they have on their supporters is quite evident. Imagine is 100% privately funded, so they are always grateful to work with such supportive corporate partners and sponsors. If you would like to learn more about Imagine visit www.imaginenj.org. They offer in-house tours to the public three times a month and encourage anyone looking to volunteer, support and of course anyone grieving themselves to join them for a tour or schedule an orientation to learn more. If you are interested in being in the 100th Home Sale Charity Program of 2018 give us a call at 973.936.9129. Do you know of a deserving local charity who would be a great addition to the program, email info@sueadler.com with “100th Home” in the subject line. We are humbled by the good each of these charities brings to our communities, and the time, energy and dedication of the volunteers invest in making our communities true communities. Visit www.SueAdler.com/100-Home for more information about these amazing local charities and donation recipients of our 2017 100th Home Sale Charity Program.